Heating fuel prices have been volatile over the past few years. How high they may go in the future will depend on many factors including the world fuel supply situation, demand, level of inflation and the weather. Good energy conservation measures can help to offset this increase and keep production costs under control. Protect fuel tanks. Twenty percent of all service calls result from dirty fuel or problems related to the flow of the fuel. Tanks should be located away from dusty locations and water tight fittings should be used. Outdoor tanks should be protected from harsh winter weather with an enclosure. Change the fuel filter on oil furnaces. It is surprising how much sludge and dirt collects in the fuel. Replace the nozzle. Wear increases the nozzle orifice opening, increasing fuel usage. Select a nozzle with the correct spray angle to fit the firebox. Follow the manufacturers’ recommendations. Inspect safety controls including flame detector cell sensor, transformer, limit switch and fan control. The mixer, a valve which combines propane gas with atmospheric air, should be serviced and tested to manufacturers’ recommendations. It’s a good idea to operate the furnace on a monthly basis during the year to check for problems. Exterior heat exchange surfaces, such as tubes, fins and radiators, collect considerable dust and dirt in a greenhouse atmosphere. Brush and vacuum surfaces to increase heat output. Clean blowers for efficient air movement. Efficiency testing of a furnace or boiler is a 10-minute procedure that can indicate when problems begin to occur. It is the key to saving money on the heating bill. Increasing efficiency one or two percent can significantly reduce fuel consumption over the year. For example, a 2% increase in efficiency of a million Btu/hr burner operating 3300 hours from September to May will save about 650 gallons of fuel oil. This estimate is based on efficiency tests conducted on greenhouse heating equipment in Connecticut and Massachusetts. The combustion process combines the carbon in the fuel with the oxygen in the air. The lack of adequate oxygen results in incomplete combustion and carbon buildup. A 400,000 Btu/hr furnace will require about 100 cubic feet of air/minute to operate efficiently. 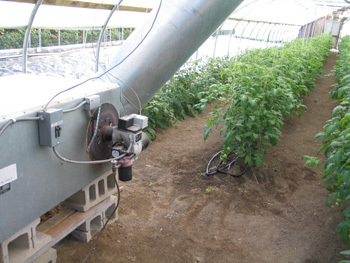 In tight poly and glass greenhouses, a makeup air supply of 1 square inch of intake area/2,000 Btu/hr burner input should be available from a pipe or louver through the endwall unless a separated-combustion heater is installed. These are installed with a direct connection to outside air. Flue pipe connections should be tight and the chimney should extend at least 2 feet above the ridge of the greenhouse. The top of the chimney should be at least 8 feet above the combustion chamber and have a cap to prevent backdrafts and possible air pollution injury to plants. Consider installing a forced convection system to expel the combustion gasses. Accurate controls are important to achieve high efficiency. The payback of replacing an old mechanical thermostat with a new electronic thermostat having a +/- 1 degree F differential is very short. The sensor should be shielded and aspirated with a small fan to quickly sense changes in the environment. Air circulation will reduce temperature stratification in the greenhouse. Installing horizontal air flow (HAF) fans that move the air at 50 to 100 cubic feet/minute (cfm) can limit temperature differences to no more than 2 degrees at any point in the growing area; an overall capaity of 3 cfm per square foot of greenhouse/growing area is recommended. Use 1/10th horsepower circulating fans located 40 to 50 feet apart to create a circular flow pattern.